Everybody loves a good crossover these days and oh boy are manga fans are in for a massive treat! 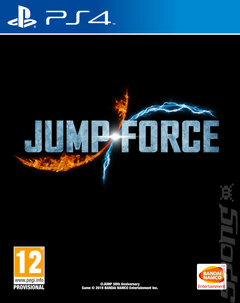 Jump Force sees the boundaries between our world and those of the Weekly Shonen Jump manga anthology start to blur and evil forces on the rise. Who can stop this rising chaos? Well, that would be the heroes of the various universes, including characters from such mighty franchises as Dragon Ball Z, One Piece and Naruto! It's the ultimate in 'who would win out of ________ and _________ for manga fans, played out on the pad in your hands! The game is a three versus three arena beat-'em-up, with players able to put together dream teams of fighters to tackle the foes ahead of them. Jump Force isn't about combos so much as it is timing, making it a game that's accessible to manga fans who can't miss out on the spectacle while retaining a level of depth that will still challenge seasoned FighterZ vets. As you'd expect with characters like Goku and Naruto in the mix, the attacks are gloriously over the top. Transforming Naruto into Nine Tails or powering up Luffy's Gear Four is as much fun as you'd expect, and the game delivers the ensuing carnage with aplomb. It doesn't take a genius to see that Jump Force is going to be carnage!